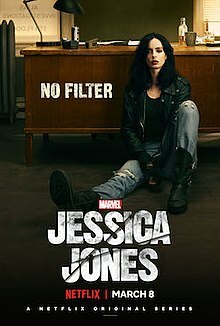 As fun as Daredevil was when it first came out on Netflix, I feel like Jessica Jones had a bigger impact when it hit. I guess it was largely because she was a protagonist who wasn't actually a hero. She was principled and perhaps good at her core but hardly a model citizen. She was presented as what happens when you have super powers, but not enough to be fully super. Given given how great the first season one and the rather shocking way things were resolved, I wasn't sure where they were going to go in a second season. After all, David Tennant's portrayal of the Purple Man was a truly memorable one and thes show is somewhat diminished with his loss as a villain. But this season went in a different direction and worked on further developing the stories of the supporting cast around Jessica as she pursues her latest investigation. It does result in some interesting character twists by the end of the season but I'm not sure if it did enough to help Jessica move forward as well. Synopsis: Jessica Jones is an American comic book drama TV series created by Melissa Rosenberg for Netflix. As of the time of this blog post a third season hasn't been confirmed just yet. Time has past since the events of the first season and The Defenders and now everyone knows that Jessica Jones (Jessica Ritter) is some sort of a vigilante superhero and responsible for the death of Kilgrave, the Purple Man. In some cases that makes people look up to her as a hero, which she doesn't like. In other cases, it makes people view her with even more suspicion, which she hates. All this just reminds her that she had been forced to kill and this weights heavily on her conscience. She once again starts to receive the usual oddball cases with her neighbor Malcolm (Eka Darville) still working as her assistant for some reason. One such case is a guy calling himself the Whizzer who claims that he has superspeed only when he's exremely afraid. He feels that people are after him but Jessica dismisses this. This later proves fatal as he dies in a strange accident involving falling construction debris. And all roads seem to lead to a group or company known as IGH that may aslo be responsible for how Jessica got her own abilities. What I Liked: Malcolm got the most development as a character, I feel, and his progression from a junkie in the first season to Jessica's assistant in this season and then his final elevation at the end is just a lot of fun. Jessica herself had an odd journey in this season and while it did not involve a big bad villain, it was nicely personal and in that regard quite valuable to her. The exploration of her past and the many revelations that came along made for some interesting story bits. And how Jessica really became this tragic hero of a sorts not wanting to get involved with people but inevitably finding more and more people reliant on her. And that struggle is what constantly pulls her apart and in the long run is what elevate the story into something else entirely. And that's when the show shines. What Could Have Been Better: While I respect the range that Carrie-Anne Moss got to demosntrate in her portrayal of Jeri Hogarth, the amount of time dedicated to her fall from grace in terms of her health and within her firm didn't feel all that necessary. Yes, by definition it was a side-plot and it's not supposed to be part of the main plot but it just had so much screen time and it barely involved Jessica so it felt more like a distraction to things. Similarly I wasn't all that happy what they did to Trish Walker (Rachael Taylor), Jessica's adoptive sister. Her obsession with IGH and how she falls into a dark place in line with past habits. It's another complex story arc but one that really brings Trish pretty low and I'm not sure if everything was all that necessary. And the way it ended just felt oddly trite and somehow ill-fitting to things as a whole. TL;DR: Jessica Jones is still a rather compelling series and one that tried to tell some serious stories in this season but felt weaker without a big villain acting as a focus. It has a lot more going on but at the same time it doesn't feel like it moves as smoothly as the last season, but it's still worth watching. So the season still gets 3.5 cases of Jessica being kickass out of a possible 5.